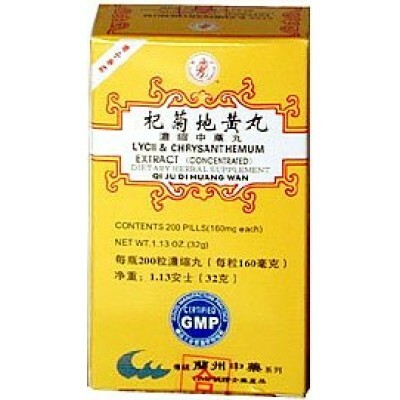 Nourishes kidney yin to replenish liver blood and yin, benefitting in particular the eyes. Treats vision problems due to deficient kidney yin or qi with symptoms that include blurry vision, dry painful eyes, pressure behind eyes, poor night vision. 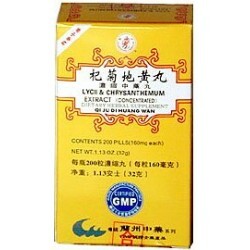 Use also for associated dizziness, headache, angry outbursts, hot palsm, restlessness and insomnia. Suitable for long term use. Ingredients: Rehmannia (cured root tuber), Asiatic dogwood (fruit without seed), Chinese Yam (rhizome), Tree peony (root bark), Asian water plantain (rhizome), Poria (sclerotium), Lycium (fruit), Chrysanthemum (flower). Directions for Use: Take 8 pills, 3 times daily with warm water.